August 9, 1985. It’s the cold war, and the Berlin Wall is years away from falling. It is the 40th anniversary of the atomic bombing of Nagasaki, Japan by the USA. U.S. President Ronald Reagan has announced a “Star Wars” initiative that would destroy enemy missiles before they land and do harm. Canadians hold strong views about whether to participate in the development of Star Wars. And an 18 year old young man by the name of Jamie Lefcoe (founder and president of Students United for Nuclear Sanity) is the in-studio guest of Radio 98’s Wayne McLean Hotline. Lefcoe’s group is against missile testing, and the arms race. McLean asks his callers: “Was it right for the USA to drop the atomic bomb on Hiroshima and on Nagasaki?”, and “Should Canada be involved in Ronald Reagan’s Star Wars Program?”. Lefcoe’s position is that Canada should not participate in Star Wars, that mutual disarmament is the way to go, and that it is irrelevant which side (USA versus the USSR) is worse. To him, the USSR’s communist philosophy and totalitarian nature is not the issue, and does not matter. 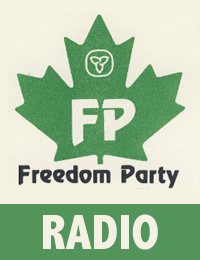 Over the course of the two hour program, three Freedom Party members call in to the show: Gord Mood, Robert Metz, and Marc Emery. London West’s MP, Tom Hockin (PC) also calls in.